The objective of this Lab activity is to verify the proportionality and superposition theorems. 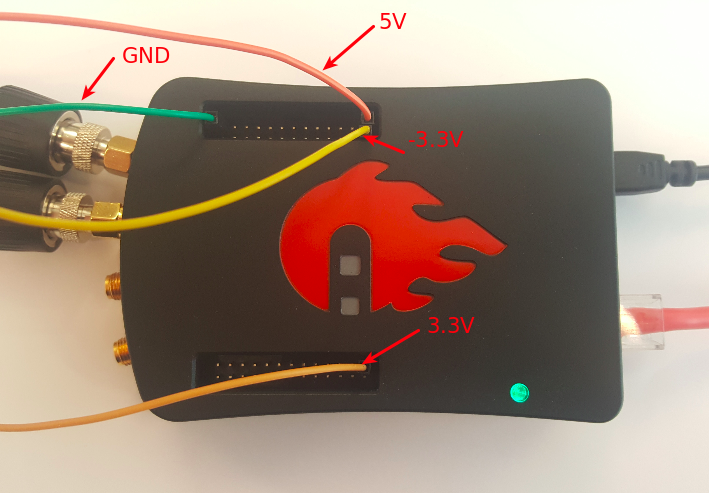 In this tutorials we use the terminology taken from the user manual when referring to the connections to the Red Pitaya STEMlab board hardware. Extension connector pins used as 5V and 3.3V voltage source are show in the documentation for connectors E1 and E2. In this activity proportionality and superposition theorems are examined by applying them to the circuits shown in the following figures. The proportionality factor A is sometimes referred to as the gain of a circuit. For the circuit in Fig. 1, the source voltage is Vin. The response Voutis across the \(4.7 k\Omega\) resistor. The most important result of linearity is superposition. The Superposition Theorem states that the response of a linear circuit with multiple independent sources, such as in figure 2, can be obtained by adding the individual responses caused by the individual sources acting alone. For an independent source acting alone, all other independent voltage sources in the circuit are replaced by short circuits and all other independent current sources are replaced by open circuits, as in figure 3. Various Resistors: - \(1 k\Omega\), - \(2.2 k\Omega\), - \(4.7 k\Omega\). Construct the circuit of figure 1. Case 1: For voltage source “Vin=5V” shown on the Figure 1 use the STEMlab voltage pin on extension connector E2. Case 2: For voltage source “Vin=3.3V” shown on the Figure 1 use the STEMlab voltage pin on extension connector E1. Case 3: For voltage source “Vin=-3.3V” shown on the Figure 1 use the STEMlab voltage pin on extension connector E2. Accurately measure Voutusing the Oscilloscope application. You should measure and record the actual fixed power supply voltages as well. Calculate the value of A in each case using Eq. (1). Plot a graph with Vinon x-axis and Vouton y-axis. Construct the circuit of Fig. 2. 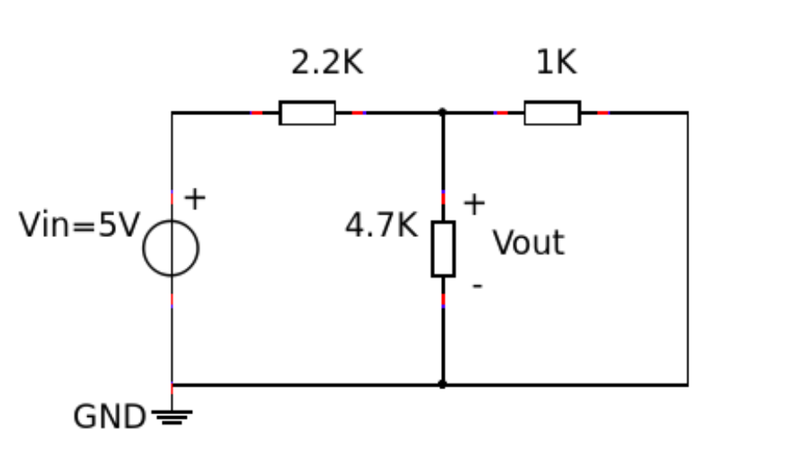 Measure and record the voltage across the \(4.7 k\Omega\) resistor. Construct the circuit of Fig. 3. Measure and record the voltage across the \(4.7 k\Omega\) resistor. Measuring voltage drop across desired resistor is done in such way that Oscilloscope probe of IN1 is connected to the one side of the resistor and Oscilloscope probe of IN2 is connected to another side of the resistor. Voltage difference Vin1-Vin2will give an voltage on the measured resistor. Calculate the total response “Vout” for circuit of figure 2 by adding the responses from measurement of circuit of figure 1 and measurement of circuit of figure 3. Compare your calculated result to what you measured in step 2a. Explain any differences. Is the graph obtained a straight line? Compute the slope of the graph at any point and compare it to the value of K obtained from the measurements. Explain any differences. For each of the three circuits you built for the superposition experiment, how well did the calculated and measured outputs compare? Explain any differences.